This is my favorite Turkish Delight recipe because you can make it in the microwave and you don't need a candy thermometer. This version is bouncy and brightly scented with pure orange extract. The powdered sugar coating has ground cloves mixed in, and the scent combination is so Christmassy! 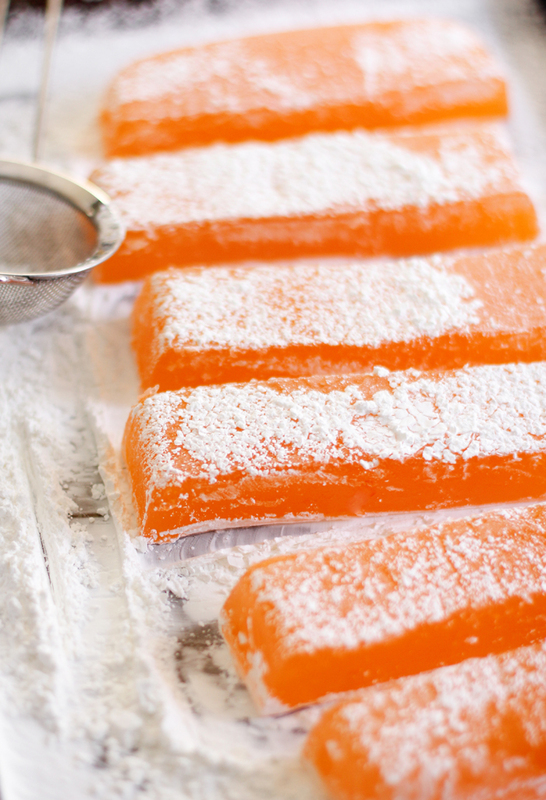 If you love the fragrance of clove-studded oranges, then you'll love this candy. These candies look pretty in festive holiday tins. Generously dust the insides of the tins with extra powdered sugar and cornstarch mixture before placing the squares inside. This will keep them from getting sticky. Pour the water into a 4-quart glass bowl. Whisk in the 3/4 cup cornstarch 1/4 cup at a time until dissolved. Microwave mixture for 2 minutes; whisk smooth. Return to microwave and heat for 2-3 more minutes, or until the mixture starts to turn opaque. Whisk again - mixture should have the appearance of white paste. Add sugar and corn syrup. Heat for 5 minutes in microwave. Remove bowl with pot holders and whisk smooth. Heat for 5 more minutes; remove and whisk smooth again. At this point the mixture will be thick and translucent. Heat for an additional 5 minutes and whisk in orange extract and food coloring. Whisk until mixture is smooth and color is evenly distributed. Heat 3 more minutes in microwave. You'll know when the mixture is done when you try to whisk the mixture and a large portion of the candy batter holds in the balloon of your whisk. Mixture will be very thick. You can check consistency by letting a small bit candy batter sit for a few minutes in a condiment cup. When cooled a little, you should be able to pick it up and roll it into a ball without it being tacky. If your batter has not reached consistency, heat at 1 minute intervals until consistency is achieved. Grease the 8x8 or loaf pan with cooking spray or oil and pour in candy batter. Spray/grease the back of a spoon -the batter doesn't spread well, so just do the best you can to spread it evenly with the back of greased spoon. Let candy set up at room temperature until firm enough to handle. This may take several hours - mine set up in about two. 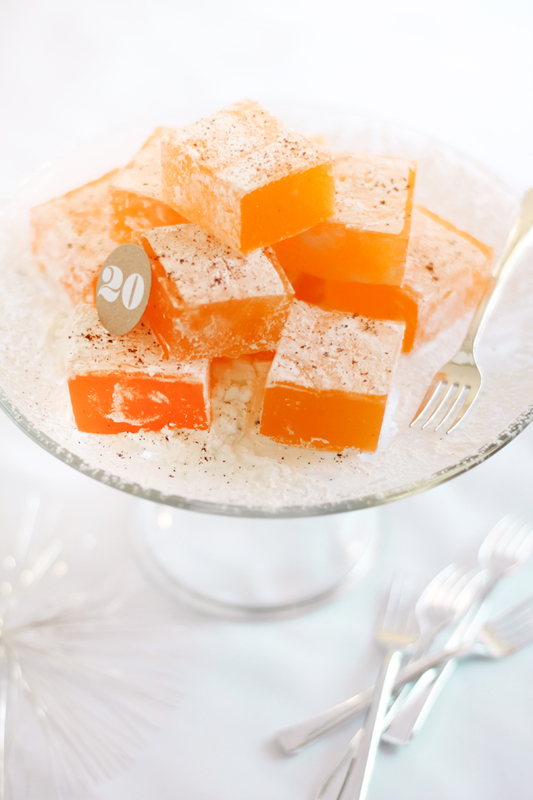 Cut candy with a sharp knife or scissors into even squares. You can do this in the pan or turn the block of candy out on a cutting board dusted with cornstarch. I cut mine a little larger than usual at about 1 1/2" square. In a bowl, combine the remaining 1/2 cup cornstarch, 1/2 cup powdered sugar and ground cloves. Dust squares in mixture. 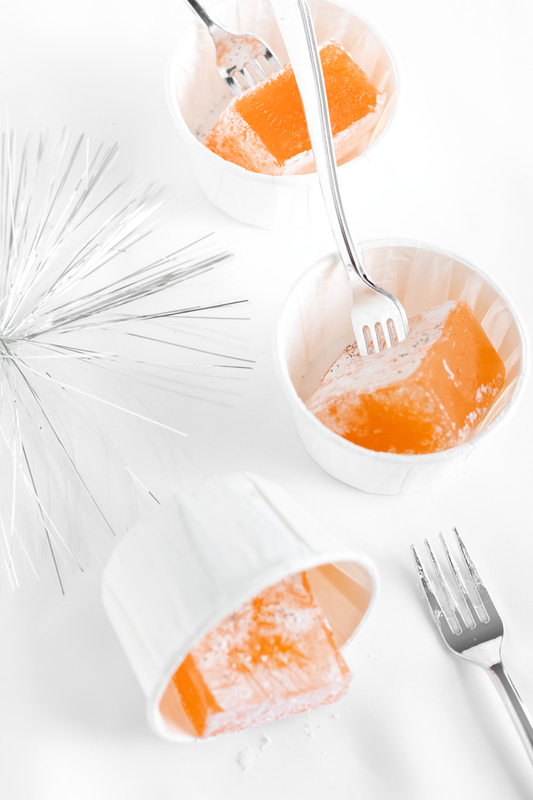 Serve with cocktail picks, or in individual paper cups. Gift these in festive holiday tins with tightly fitting lids. Generously dust the tins with extra powdered sugar and cornstarch mixture before placing the candies inside. Store in the refrigerator. Is orange essential oil ok to use? Yes! As long as it's food grade essential oil. Oils are more concentrated than extracts so I'd only use about 1/2 teaspoon of the essential oil in this recipe. I don´t own a microwave... is it possible to make this recipe on the stove??? I don't have instructions for the stove-top currently. I'll put it on my to-do list. Thanks for asking! Every microwave is so different. Do you have more precise instructions for doing this stove top with a thermometer? I don't have stove-top instructions for this recipe. However, I can tell you that I've made this in three different household microwaves between 700 and 1000 watts, with success. All batches were cooked at 100% power. I'll try to revisit this recipe on the stove top, but I am certain it will be after the holidays. Thanks for your question! Looks delicious! Just curious - which orange extract did you use? They vary so widely in intensity and some have off flavors. Thanks! I have a question regarding the flavor. I love Turkish Delight, but I'm none too fond of orange...Could you swap out the orange oil for rosewater, and remove the spices?